German physician; born April 20, 1790, at Königsberg, Prussia; died 1851 at Halle, Saxony. He entered the Königsberg University at the age of fifteen, and studied medicine (M.D. 1812), evincing at the same time a predilection for philological, literary, and esthetical studies which led to a lifelong friendship with Max von Schenkendorf. He took part in the campaign of 1813 and went with the army to Paris, where he was promoted to the office of chief physician of a camp-hospital. In 1814 he resigned from military service and went to Carlsruhe; there, through the intervention of his friend Schenkendorf, he became acquainted with Jung-Stilling, John Ludwig Ewald, and Mme. Krüdener, whose mystical tendencies exercised a deep influence upon his mind. After a short stay in Carlsruhe he went to Vienna, and in 1815 to Italy, through his companion, the painter Philipp Veit, where he associated chiefly with artists. He described the impressions of his journey in a book published 1818-20 in Leipsic ("Ansichten von Italien Während einer Reise in den Jahren 1815-1816"). 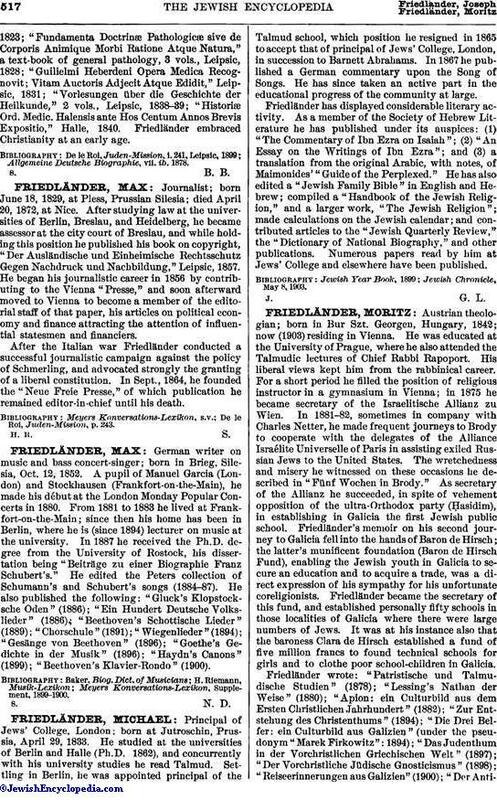 Upon his return to Germany (1817) Friedländer was admitted as privat-docent in medicine at Halle. In 1819 he was appointed assistant professor, and in 1823 professor, of theoretical medicine; he held this chair till his death. Friedländer wrote: "De Institutione ad Medicinam Libri Duo," a methodology of medicine, Halle,1823; "Fundamenta Doctrinæ Pathologicæ sive de Corporis Animique Morbi Ratione Atque Natura," a text-book of general pathology, 3 vols., Leipsic, 1828; "Guilielmi Heberdeni Opera Medica Recognovit; Vitam Auctoris Adjecit Atque Edidit," Leipsic, 1831; "Vorlesungen über die Geschichte der Heilkunde," 2 vols., Leipsic, 1838-39; "Historiæ Ord. Medic. Halensis ante Hos Centum Annos Brevis Expositio," Halle, 1840. 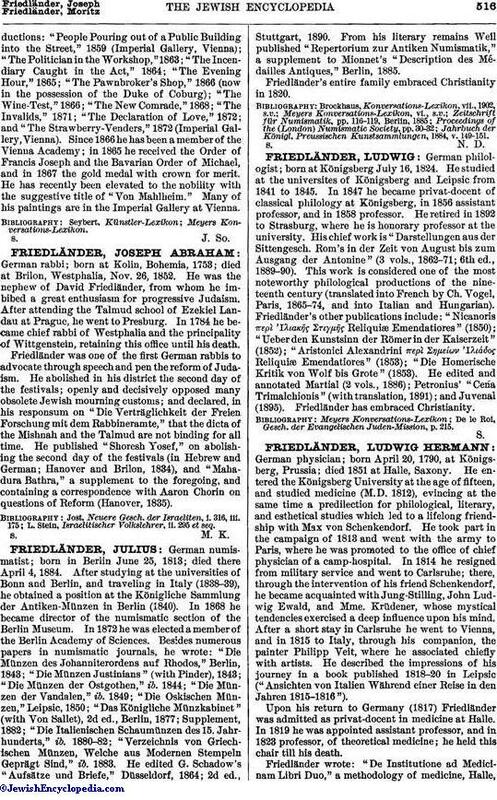 Friedländer embraced Christianity at an early age. Allgemeine Deutsche Biographie, vii. ib. 1878.